Every time I think I am out of projects to blog about another pops up. This time it is a piece of knitted trim intended for a pillowcase. I just like lacy pillowcases. 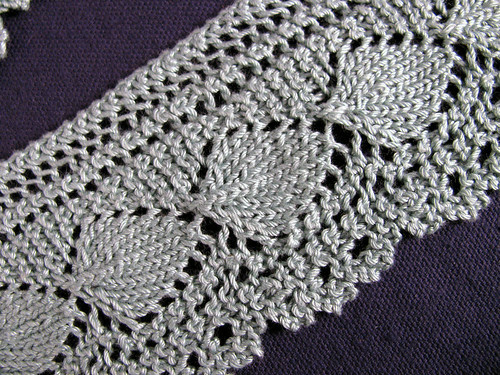 It was knit using size 1 needles and size 10 crochet cotton. I used the cheap stuff because I really liked this particular color of grey green. I have way too many almost done projects. This knit trim should be applied to a pillowcase and not living in a zip-lock bag. The end is finished with waste yarn, so I can either graft it to the beginning or keep knitting and make the edging longer, say, for a curtain valance. I think getting back into a project is much harder than starting something completely new. Why is that? 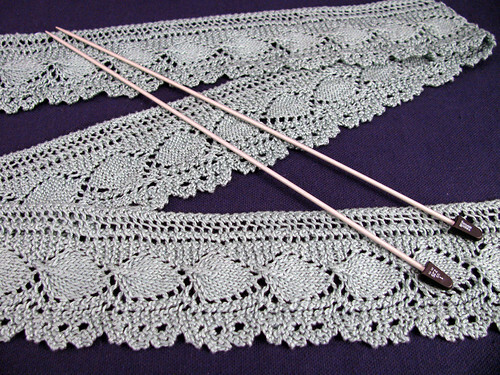 This entry was posted on Saturday, February 7th, 2009 at 3:00 am and is filed under Knitting and Lace. Tagged: Knitting, Lace, Needlework, Pillowcases, Thread. You can feed this entry. You can leave a response, or trackback from your own site. I’d love to see some of your pillowcases! Is that a self devised pattern? That is lovely! Sew it on something and enjoy it! I think it can be harder to get back to something old because there is always that worry of “where was I?” Even when I’ve documented where I was, I still worry.